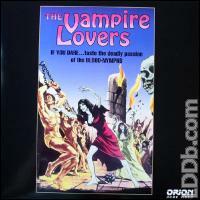 THE VAMPIRE LOVERS,US RELEASE ON MARCH 26,1997.FACTORY SEALED,PLASTIC COVERING INTACT. NO CORNER JAMS,CREASING,OR SEAM TEARS NOTED. CREATED CIRCA 1970. PETER CUSHING STARS. Near-mint jacket and disc from a private collection. Glossy covers have little to no rub-wear. Excellent gatefold has no creasing and perfect corners, though with several nicks and scuffs along the spine. Covers have some rub-wear. Disc is near-mint. Disc like new. Cover has some shelf wear. From serious collector.